Now I realize that buying a kettle isn’t exactly headline news, but as I have lived without one since June 2004 buying my new kettle last month was a bit of an event. Just in case you have a few questions for me about my kettle-less life let me give some anticipatory answers. How can you be so precise about the date you last had a kettle? Simple, I moved into my new place in June 2004 and my existing kettle on its last legs didn’t come with me. How did you live without a kettle? Well, that was easy I have a coffee machine and I used a saucepan to boil water for pots of tea. Why didn’t you buy a new kettle in 2004? Well, er, how shall I put this without offending kettle manufactures everywhere, mostly I find kettles aesthetically challenged and as I was decanting my life into a smaller space there was no where for the kettle to hide. However, I was constantly forgetting to put away the saucepan after bouts of tea making and it hanging about on the worktop looked even worse than the ugliest of kettles. So readers after nearly seven years without one I bought a new kettle. 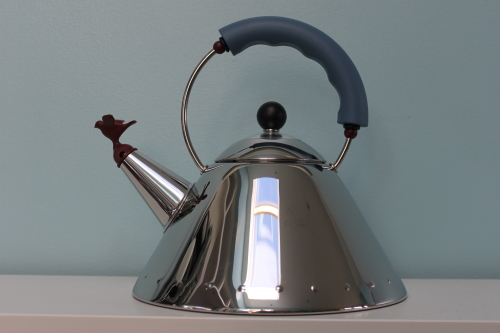 I like the new kettle a lot, particular the bird in the spout. The design is by American architect Michael Graves for Alessi. Bye for now, I am off to make some tea.